From the response to last week’s article, it seems the Nexus readership shares my interest in discussing the parameters and strategic relevance of Modern archetypes. Our community raised some insightful points in the comments, so today I’ll address those and expand a little on my theory – especially delving into my thoughts on spectrums. “Theory” is the operative word here. I don’t believe in the existence of a system that flawlessly compartmentalizes all Magic archetypes. Anything Chapin writes, or Sullivan writes, or I write about archetypes merely aims to be relevant enough of the time to prove practical – theories and principles must offer us something to have any merit. Last week, I went over some of the benefits a passable sorting system offers Magic players: the ability to analyze what a deck’s plan is, the roles it plays in a matchup, and the role it prefers to play most of the time. These classifications aid with both tournament preparation and in-game strategy. But I’ll state here, in no uncertain terms, that the theory I propose in these articles is by no means one to live and die by. It’s a tool I find helpful and that I enjoy sharing with other players, in the hopes that they can also make use of it. Before we move on with the theory, I have some cleaning up to do after last week. I got a message from one reader who described “unfair” as difficult to interact with, or preventative of future interactions. These definitions look great on paper, but they beg the questions, “how difficult?” and “how preventative?” Say your Merfolk opponent hits his land drops on time, resolves Spreading Seas on your Stomping Ground, Vapor Snags your Grim Lavamancer, and curves out perfectly with an Aether Vial, killing you with an unblockable team on turn five. These kinds of draws are very difficult for many decks to interact with, and the Seas + islandwalk combination prevents blockers from walling the onslaught (or even leaving your hand!). Still, very few players would call Merfolk “unfair.” Doing so leads to the unfortunate scenario of the word losing all meaning, as in Carsten Kotter’s nightmarish “Fair // Unfair” from 2013. Kotter muddles “unfair” and “powerful,” yielding an article about nothing and a lot of confusion amongst his readership (just take a look at the comments). We can hopefully agree on the vagueness of “difficult to interact with” and “preventative of future plays.” “Nontraditional” is far less vague. 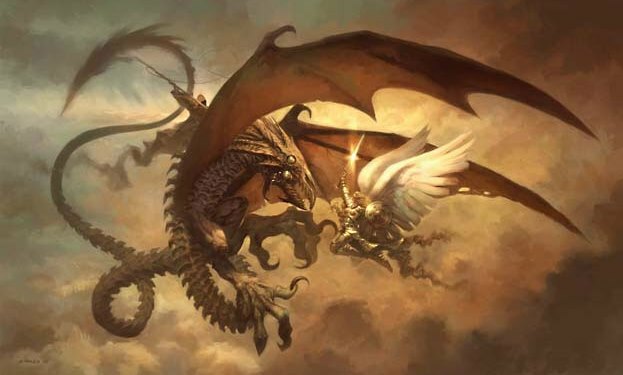 We can draw a clear line between traditional and nontraditional by asking, “does the deck win by attacking with creatures?” Some nontraditional means of winning include infinite combos, planeswalker ultimates, damage from reach, and Darksteel Reactor. We’ve already gone over nontraditional win conditions, so I’ll jump right into the scare quotes. Going from “zero to hero” means securing a victory in a single turn from a position resembling the game’s original state – in other words, dealing 20 points of damage or 10 points of poison. Making 1,000,000 hasty Pestermite copies, sacrificing a developed board to Arcbound Ravager and putting the counters on an unblocked attacker, and Chording for two Shaman of the Packs with 10 Elves on the battlefield are all examples of “zero to hero.” (There’s still a gray area; a fuzzier “zero to hero” is resolving Emrakul, the Aeons Torn, which gives Tron players another turn to attack for 15.) Aggro decks that go “zero to hero” become Aggro-Combo. I had originally classified Ramp as a sub-section of Midrange (along with Rock), and defined Midrange as an Aggro-Control hybrid. While Rock decks disrupt opponents long enough to pull themselves into a gamestate where they can begin to resolve haymakers (such as Siege Rhino or Keranos, God of Storms), Ramp decks trade Rock’s interaction for mana acceleration, allowing them to access the “haymaker stage” much earlier than the opponent. The two decks aren’t far removed from each other in terms of finishers, since they both employ some method – either disruption or acceleration – to propel themselves into a stellar late-game. Since Ramp decks generally go so light on interaction, I’m hesitant to classify them as Aggro-Control. That leaves us with one of two options: we can stop calling Ramp a Midrange deck, or we can refute the claim that all Midrange decks are Aggro-Control decks. The first option seems more elegant to me, but how do we then classify Ramp decks? Chingsung Chang calls ramp decks “The Big Spell,” and does a fine job of summing up their strengths and weaknesses in relation to other archetypes. But these proactive, linear, and often unfair decks don’t fit smoothly into any of the hybrid categories discussed last week, so I move to bench the issue for now. In my analysis of Twin as an Aggro-Control-Combo deck, I never meant to peg it as an Aggro deck. Still, it does frequently operate as midrange or tempo while (or, in addition to) assembling its combo. Grixis Twin shows the strategy at its most midrange, heavily disrupting opponents and winning via attrition and aggression if it doesn’t find a window to go off. Temur Twin represents Twin as a Tempo deck, often winning on the back of Tarmogoyf, Snapcaster Mage, and Pestermite before opponents can stabilize. Both Midrange and Tempo operate in similar ways, supplementing cost-efficient creatures with disruption to win games. As such, they both qualify as Aggro-Control, an interactive hybrid. As seen in Splinter Twin, or the now extinct Birthing Pod decks of Modern past, adding reliable infinite combos to a Midrange or Tempo deck creates Aggro-Control-Combo. Since Aggro-Control decks use tempo, the in-game mechanic, more than other Magic archetypes, they reap extra benefits from adding an infinite combo; just the threat of going off forces opponents to, say, hold up Path to Exile instead of impacting the board. When opponents “play safe” in this way, they give up tempo to the Aggro-Control-Combo player, who may not have a Splinter Twin in his hand – or even in his post-board 60! Lastly, I misspoke about Jeskai Control and Grixis Control. MTGGoldfish lists the matchup at 54-47 in Grixis’s favor. Since I opened my article with a paragraph explaining Jeskai’s dominance here, my claim stands out as an embarrassing blunder. I still think Jeskai has some pull against Grixis, especially if it simply adapts to the metagame – as pointed out in the comments, a couple copies of Rest in Peace would go a long way to improving the Grixis matchup. Either way, the numbers suggest that Grixis has the edge here. If Jeskai Control loses to Grixis Control, which I identified as a Midrange deck, how does the rest of my article hold up? According to my theory, a Midrange deck shouldn’t consistently beat a dedicated Control deck. We’ll solve this problem by exploring the archetype spectrum. One of the comments on last week’s article linked to Adrian Sullivan’s article, “Why Midrange Rules Today’s Standard.” He submits the following graph on Aggro vs. Control, which helps illustrate the physicality of a spectrum. While Sullvan’s archetype names don’t exactly fit the ones we’re working with, we can still follow along the line between “Aggro” and “Control” to measure how “close” a deck is to either strategy. Just based on the visual, we can deduce that a deck located in the “Hybrid Control” category is more controlling than one located on the “Aggro Control” dot. Every non-Combo deck falls somewhere on the circular line between Control and Aggro. In my adjusted version of the diagram, below, I differentiate each side of the line by color. The side each deck belongs on – left or right; blue or green – depends on whether it wants to commit threats before disrupting opponents, or to disrupt before committing threats. In other words, the side a deck falls on depends on whether it’s Tempo or Midrange. 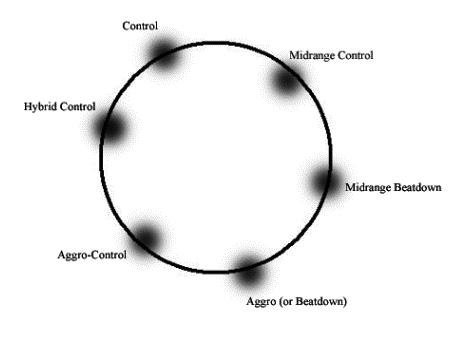 With this diagram in mind, we can physically position decks on the Aggro-Control spectrum. Last week, I said that “Control beats Midrange.” Control decks obviously don’t always have the upper hand against midrange decks. 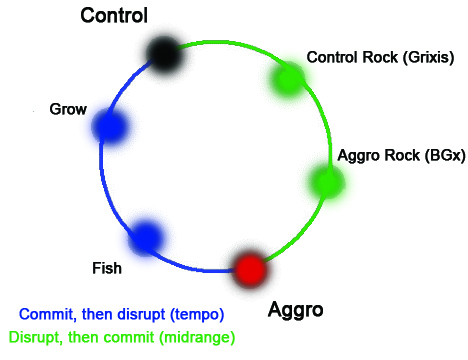 But this diagram has a golden rule: in general, as the archetypes move clockwise on the circle, they beat the next one in line (Aggro beats Fish, which beats Grow, which beats Control, etc.). I stand by my claim that, in the abstract, Midrange decks lose to Control decks, as Control takes advantage of the late-game better than Midrange. One way to beat Jeskai Control is for Grixis Control to reverse its disrupt-then-commit plan, essentially becoming a slower Tempo deck. “Slower,” but not as slow as Jeskai by a long shot – with all those post-board Dispels, Grixis can reliably land a Tasigur and protect it long enough to win. As discussed last week, Tempo decks beat Control decks. In this case, Jeskai Control remains a Control deck, but Grixis Control sequences its aggro-control elements in a way that pushes it along the archetype spectrum to become favored in this matchup. With its few creatures and heavy disruptive suite, Grixis ends up resembling a Grow deck, and not a Fish deck. Another tempo element Grixis decks have access to is mana denial. Today, most Grixis decks phase out Blood Moon for Fulminator Mage, which synergizes better with Tasigur, the Golden Fang and Kolaghan’s Command. Either way, these cheap sources of mana denial have always devastated control strategies, and rear their heads most often in Tempo decks. Legacy’s Canadian Threshold, for instance, combines Stifle, Wasteland, and Daze to give decks looking to cast big spells (not that Sphinx’s Revelation is a Legacy card) a tough time. Its mana denial elements give Grixis even more game as a Tempo deck against Jeskai Control. Grixis Control also has Kolaghan’s Command over Jeskai. The card definitely seems sweet for its control applications, but KC’s go-long potential doesn’t win the games here. Command shines in this matchup because it fits into the Grixis deck’s newfound tempo plan. Aggro-Control decks play more threats than Control decks, and since Grixis Control is closer to the Control side of the green line, it doesn’t have an unlimited reservoir of creatures to throw at its opponent. Grow decks, for example, play 12-16 creatures; Fish decks often play more than 20. This sheer volume of threats overload a Control player’s removal when combined with disruption. In the Jeskai vs. Grixis matchup, if a pair of Bolts do manage to take out a Gurmag Angler, Kolaghan’s Command doubles as an extra copy of that threat (tearing apart Jeskai’s hand, or blowing up a Batterskull, is just icing). Take a look at Patrick Chapin’s Grixis Control deck from GP Charlotte. Chapin plays a miserly nine creatures, and four of them die to Lightning Bolt. In the Jeskai matchup, Command retrieves creatures from the grave, raising his virtual creature count to 11 – and, if he’s flashing Command back with Snapcaster, the number gets even higher. We can see that Grixis Control beats Jeskai Control in a full match, at least on paper, because it has the tools to do a reasonable Tempo impression for games two and three. Consider the golden rule: Jeskai Control sits higher on the green line than Grixis Control, but if Grixis moves from just after the Control dot to just before it, that deck suddenly becomes the predator. As I stated earlier, theories are only worthwhile if they help us in some way. So what does slotting decks into places on the blue or green lines do for us as players? For one, the archetype advantages and disadvantages associated with aggro and control apply to the hybrid decks residing on the blue or green lines. The Grixis Control player can tweak a few cards in his deck and end up with a set of Delvers, helping him play a tempo game pre-board and improving his percentages against Control decks. But since Grow decks generally lose to Midrange, he gives up points against BGx in the process. Additionally, visualizing the aggro-control spectrum shows us the limits of a deck’s transformational capacity. Our Grixis pilot must ask himself between games whether he can out-control his opponent’s deck. Against Jeskai Control, he can’t, so he swings over to the blue line inasmuch as his deck will allow. Against Jund decks, he has the clear advantage staying within his control rock role, while the BGx mage has to get creative to beat Grixis Control. Probably, he moves down on the green line towards the red aggro dot, aiming to race Grixis before it stabilizes. It also becomes easier in-game to assess an opponent’s potential post-board plans. To beat Jeskai Control (located very high on the green line), Grixis Control abandons its midrange plan to take up a tempo strategy. In doing so, it migrates from its VIP spot on the green control rock dot to a location between Grow and Control, on the blue line. Based on the diagram, opponents of Grixis can safely reason that the deck won’t be able to do a complete 180 and become a fish deck; in fact, no deck can execute such a drastic transformation. Similarly, if a Fish deck wants to enact a midrange plan against a much faster Aggro deck, it can at best move closer to the Aggro Rock section, landing somewhere between that and pure Aggro. According to the golden rule, that’s where it wants to be: directly before the Aggro deck. Expecting something like Hatebears to gain the same disruptive strength of Control Rock is unreasonable, as a deck can only travel so far away from its default location on the circle. Sullivan argues that Combo decks operate on another axis entirely, and don’t smoothly fit into his Aggro-Control graph. I can think of some ways to integrate combo elements by utilizing the center of the circle, and may pursue this endeavor in another article. For now, I look forward to continuing this discussion in the comments section. That was a good theoretical discussion, although it took me a bit of time to truly feel like I had digested it and understood the underlying concepts. I’ll start by congratulating you for acknowledging the feedback you got from the comments, and for looking to improve your archetype definition. I think that the search for where to place “ramp” is a tricky one, but my opinion is that most of the decks that employ it skew toward combo. Thus once you figure out where combo goes, you’ll have a better idea on where to place ramp. Speaking of combo, I’m with Sullivan in that it’s probably best described as a third axis. On that axis, I think most Modern combo decks fall into one of two camps: fast combo, which usually doesn’t win outright, but gets you overwhelmingly ahead when the combo conditions are met (examples are RG Tron, Elves, and Bloom Titan when it goes the Titan route), and certain combo, which ends the game outright (Ad Nauseam, Grishoalbrand, Infect, Storm, and Bloom Titan when it goes Hive Mind + Pact). I think there’s quite a bit more nuance to it all, of course, but I think that’s a good place to start. What say you? Well, I’m glad you took the time to digest it! I like efficient and dense, but clear, writing. I value articles that ask readers to look over them twice before fully understanding more highly than those that don’t, but are twice as long. I also agree with your ideas. Lots of decks boast what I call “combo elements” without actually having a two-card instant-win-from-any-position. Elves, RG Tron, Infect, and Affinity all fall into this “synergy-based combo” category, which just plays differently from stuff like Ad Nauseam and Titan. Then you need to relook at your definition. Because nothing about American Control is ‘unfair’ – it might be annoying as hell, but it’s definitely a fair game of magic being played. To me the answer lies in the zero to hero section. If it fails that test, it’s not unfair. (hero doesn’t necessarily need to be the win, but it helps – I’m looking at things like turn 3 Karn, which is pretty unfair). Although this definition can almost entirely be read as ‘combo’. A more narrow definition would be something like – does it break the fundamental rules of magic i.e. play 1 land per turn (Tron/Amulet), actually cast creatures (Twin) or spells (Storm), draw 1 card per turn (Ad Nauseaum). And ultimately what I think people feel, they have a chance of playing/drawing their way out of a position against the deck. If this criteria is not met, I think people would consider the game of magic they just played ‘unfair’. So what’s an unfair deck? It’s a deck that doesn’t have the above characteristics – it doesn’t care about interacting, it tries to play its spells as quickly as possible/in one turn, it can win at any given moment, doesn’t really want the game to go long and/or can ramp up its mana production quickly outside of mana-dorks. I may redraft my definition of unfair, but for now I’m sticking with it. Maybe I wasn’t clear enough in the text – I said that if a deck has a nontraditional, reliable win condition, it’s generally unfair. I understand that Jeskai Control feels fair to you, but it’s not according to my definition. The deck often wins with reach from stockpiled burn spells or with planeswalker ultimates. But everyone has their own definitions and that’s fine! Unfortunately, I don’t think we can define “fair” and leave “unfair” out of the picture. Everything is a binary. If we’re going to talk in black-and-white terms, or consider a spectrum, we need clear definitions for each side. You can list the characteristics of a “fair deck,” but in doing so, you’re admitting that decks that don’t meet those characteristics are unfair. On threatening a win from a losing position, I basically covered that in my “zero to hero” bit. But I still think we have to define “losing” here. Lots of decks can threaten wins from losing positions by topdecking their “out,” like a Tribal Flames with opponents at 5 life. So was that player in a “losing position” at all? What if he had no cards in hand, no board presence, and was facing down a team of Siege Rhinos at 1 life? I’d say so. If not, then a losing position implies the player has no outs, in which case even “unfair decks” in losing positions can’t threaten instant victories. The point of this comment isn’t to call your definition worse than mine. I’m just saying that it’s not perfect. As disclaimered (I love these) in the article, no definition is ever perfect; everything exists, to some degree, in a gray area. My definition doesn’t have the problems yours does, but at the same time, many might disagree with it on the basis that they feel Jeskai Control is a fair deck, maybe even for the same reasons as you. Hi Jordan, thanks for insightful article. I really like that you’ve built on your previous article as well as addressing some concerns from it. The spectrum idea & diagram, I feel, add a lot and help explain the concept of shifting roles. I do, however, agree with justaguy as far as Jeskai Control goes – typical Jeskai Control builds are as “fair” as it gets – even when they win partly through a planeswalker activation. In this example Jace has to pull out burn spells to be able to win on the spot – pure card advantage, but sorta similar to a good topdeck, and burn spells are a “fair” win con – or to pull out some kind of spell-based combo, which itself might be “unfair”. A planeswalker’s activations don’t, in and of themselves, outright win a game out of nowhere in zero to hero fashion though they can be backbreaking (ie. Liliana of the Veil ultimate); instead they can potentially enable something else to win the game for you (the spell-based combo, burn, help get through creature damage). The other aspect of that is that, due to the loyalty counters, a planeswalker’s ultimate is never zero-to-hero in the sense that you always know it’s coming (and when it’s coming) several turns before it happens (outside of T-Woos Doubling Season deck) and you can interact with the planeswalker to stop it. I know that comes back to the definition of what’s fair/unfair, as you said, but I guess I’d like to say that I think that just because something is non-traditional (ie. getting two final burn spells off of Jace) doesn’t make it “unfair” by explicit or implicit game or format rules, especially when it seems that game mechanics like planeswalker activations were specifically designed by WotC to act they way they do. Zero to hero and winning in nontraditional means (not through attacks) are not necessarily the same thing. Jeskai never wins in a zero to hero way, but I think winning through card advantage (i.e. stockpiling burn) is nontraditional. According to my definition, traditional means attacking with creatures. Thanks for the response. 🙂 First off, I hope you don’t feel I’m attacking you by disagreeing with you, that’s definitely not my intent – I enjoy academic disagreement as it creates thought-provoking dialogue that enables me to expand my thinking about theorizing and conceptualizing MTG. I agree with everything you said in your response and perhaps could have been clearer in my initial post. However, I still think the criteria you use for fair/unfair is problematic (though I totally understand when you say it’s useful simply as way of organizing/processing information). Below is a list of T1+T2 decks (according to mtgsalvation) along with a couple “developing” combo decks. What I think this illustrates is that under this definition of fair/unfair, most decks in modern are either outright unfair, or sitting on the gray area between fair/unfair, and there are very few truly “fair” decks in the format (especially as combo decks usually are specifically designed to be zero-to-hero decks). Now, that could be just how you feel about modern in general, that it’s an “unfair” format. Personally, I would argue that most of the decks in the gray area are “fair” (Merfolk, Jund, Jeskai Control, Burn, 8 Rack, and, more controversially, maybe even Scapeshift) because none of them have infinite combos or typically violate format general rules (ie. killing before turn 4), even though some may win in a non-traditional way. My suggestion would be that non-traditional-ness shouldn’t be a major consideration for “unfairness” since non-traditional decks (ie. Burn) can still operate on the basic, newbie principles of magic – draw one card, play one land per turn. Now maybe this is just a semantic debate, but I think it’s worth thinking about and talking about and I appreciate your article and insight. 🙂 Thanks. For the record, I do think Modern is defined by unfair, aggressive strategies. The only viable interactive decks are in BGx and URx, since those are the colors of Inqusition/Decay/Goyf and Bolt-Snap-Bolt, respectively. Other colors really don’t offer much in the way of interaction, pushing decks made up of those colors into linearland. Still, I don’t think you understood “zero to hero.” Merfolk, for instance, does not go “zero to hero.” It’s a synergistic Fish deck (aka interactive – see Vapor Snag, Dismember, Seas, Pierce) that boasts scaling damage via lord synergies, but how often does it take opponents from 20 life to 0 life in a single turn? I would argue never. When it comes to winning via nontraditional means, there’s a big difference between drawing an extra card every turn with Confidant (and usually, immediately playing it) or winning with a playset of Lightning Bolt that you happen to draw and having the reliable plan of burning opponents out from their starting life total because you amass so much card advantage. As I said in the article, decks trying to win in nontraditional means are only unfair if they have an unfair win condition as a reliable strategy. Jund doesn’t go into matches thinking, “okay, I have to deal with my opponent’s plays, then land a Confidant and draw four Bolts off it.” They just want to deal with opposing plays and attack for the win. They can win with reach sometimes, but the deck is by no means built to win that way. As for the gray area section, I think most of these decks are on a spectrum. It’s always going to be difficult to give decks a hard categorization. Like I said, you need to have a reason to categorize so that it’s helpful; categorized this way, the dynamic between Tempo and these decks, or Midrange and these decks, becomes very clear (Tempo is a watered-down aggro deck built to beat unfair strategies, and Midrange is one built to beat fair strategies). I put a “~” next to the Unfair section with the most contentious inclusions. Hi Jordan, thanks for the thought-provoking response. Your comments are making me really reflect and somewhat reshape my thinking (in a good way, I think). I really liked your re-categorization of the decks, as well as the explanation for them and think it (mostly) makes a lot of sense. Calling them fair, (somewhat/sometimes) unfair, and outright unfair seems a good way to categorize them. I absolutely agree both Jund and Merfolk are “fair” decks, and have never thought otherwise, I was just trying to say that under the definition you had I think they both win in “unfair” ways sometimes. For both, however, I think that may be more a reflection of the decks that I tend to play, and how those two decks have to shift roles somewhat (especially Merfolk) to beat the decks I play, rather than how those two decks play against the field. That’s definitely narrow-sighted, and I didn’t fully realize that until I thought a bit about your comment. You see, I tend to play creature-heavy aggro or midrangy decks (ie. Hatebears, D&T, Wilted-Abzan, Wb Tokens). Jund sometimes can’t just go ground beat-down vs. these decks (due to my decks out-creaturing it), and needs a haymaker like Olivia to stick around, or to get in just enough damage to then be able to send 1-2 burn spells to the dome for the win. Dark Confidant is one of the worst cards to see for me because it means I’ll lose the card advantage race if I don’t kill it and the game goes for a while. Merfolk, on the other hand, has lots of creatures but often can’t profitably attack into my dudes (ie. first strike Golem tokens, Loxodon Smiter) without a bunch of lords (usually 3+) in play and/or the lord + seas combo/synergy. I’ve had a lot of games vs. the fish where the board stalls out on the ground and I’m getting in there with fliers (Flickerwisp, BoPs) while they wait to draw into enough un-answered lords or the combo. From personal experience, I can say Merfolk does, at least vs. some decks, take a player from 20 (or 15-17, as is often the case with a modern land-base) to 0 in one attack. Your definition of zero-to-hero is: “securing a victory in a single turn from a position resembling the game’s original state – in other words, dealing 20 points of damage or 10 points of poison.” It’s certainly not the zero-to-hero style that Storm has (basically no board presence at all), but it still can go from being out-gunned to winning the game immediately with the right draw. How often does that zero-to-hero happen? I couldn’t say for sure, I’ve not tracked it. But I’ve had it enough times to not want to rely on fliers to gradually peck away at a Merfolk players’ life total unless I have no other choice, because eventually they’ll draw the right piece(s) to win with an all-out attack that ends the game on the spot. Again, I think that speaks to the importance of the discussion about shifting roles (like Merfolk going from Aggro-Control to somewhat Aggro-Combo), and how in a competitive format like modern either your deck has to be both powerful and very pro-active (like infect, amulet bloom) or it has to have the ability to shift roles to survive a diverse meta-game. Like you, I feel modern is currently a format dominated by unfair decks and I’ve recently switched to playing Abzan Company instead due to its ability to threaten a win out of nowhere – “fair” decks like tokens and wilted-abzan just don’t seem to cut it right now with so many combo decks. I mostly like the meta, but I’m hoping that changes sometime in the future since my favourite games are the tight, grindy ones that reward tight play. I don’t feel like I have fully captured what I think should define “fair”/“unfair”, but you’ve really got me thinking about it and hopefully I’ll be able to share that with you in a post in a future article you write. My reason for defining fair first – was because once you know what fair is, everything that’s not that is automatically unfair. In general you define the non-dependent set – in a world of no fair decks, there can’t be unfair decks. My definition of fair was intentionally gray because I know decks slide on a spectrum and that not all boxes can be ticked. So to go to all your counter-examples – by my definition they’re all still fair because they fulfill the majority of the criteria I listed (note the word “Generally”). When a deck goes out of its way to specifically break one of those rules, it starts edging towards unfair. To go to your discussion about ‘zero to hero’ or ‘winning from a losing position’ – I think I need to be more clear here. Let’s take Storm as an example (although Twin and Ad Naus do play this line in a similar way). Effectively you spend your turns crafting your hand, while your ‘fair’ opponent develops their board and starts attacking you and bring your life total lower and lower. Eventually you’re at the point where you die next turn – so you hit the ‘let’s do it’ button and you try combo off. Top decking Tribal Flames isn’t at all the same thing that I’m talking about – because that’s just a finisher to a bunch of work that was done by your creatures/burn spells beforehand. In that case, how many boxes do decks have to “tick” to be categorized as unfair? It just becomes impossible at that point to categorize anything. And if we can’t categorize, we can’t reap the benefits of doing so (listed at the bottom of the article). Like I said, we all have our own definitions of fair and unfair, and there’s no reason to have definitions at all if they don’t help us. I have the definition I described in the article because it’s easy to apply to decks (i.e. less ambiguous) and is very helpful to me when it comes to brewing/preparing for events/making in-game decisions. My goal with this article is to share what I’ve found helpful with the community. If your definition benefits you, then by all means, continue using it! But it doesn’t work for me, for the reasons stated in my post above. I don’t really think classifying decks as fair/unfair actually helps anyone other than those trying to prove/disprove some point regarding Modern/the Modern banlist. I suppose here’s a question back at you – what does it help you to classify UWR Control as unfair? For me the only thing that really matters in Modern (and Magic in general) is “whose the beatdown?”. Once you figure that out, your decision making will improve regardless of discussions about fairness in particular (and arguments about affinity is combo or aggro as well). What unfairness helps understand is ‘if I tap out do I die’ or ‘how long do I left have to win this game’ – but those are matters of deck knowledge rather than fair/unfair knowledge. Good question. It helps understand the positioning of Tempo and Midrange, and the interactions the blue and green lines have in relation to fair and unfair strategies. In general, the Tempo decks beat up on unfair strategies, while Midrange beats up on fair ones. Tempo decks beat Control, for example, while Midrange decks lose to it (see archetype spectrums above). It may seem like a game of gotcha – but my goal really isn’t to prove you wrong or me right – rather to get a better understanding of Modern and the decks. Going by http://www.mtggoldfish.com/archetype/modern-grixis-control-17114#online – Grixis Control is favoured against the Tempo strategies (RUG and Grixis Delver, as well as TarmoTwin – the tempo version) but is unfavoured against the two Midrange decks (only marginally in the case of Jund). What’s Grixis Control good against – unfair decks. But this doesn’t mean anything in the context of fair/unfair. If your argument is Tempo beats unfair, midrange beats fair (by being the better fair deck) then maybe. Although I think Midrange is the police beating up on the unfair decks as well (mostly through hand disruption). I’m now going around in weird circles that I’m not sure of. I really just want to go back to my main point – let’s define fair first. Then whatever is not that is unfair, that’s the cleanest way of describing things. But I don’t think you’re going to get consensus on what’s fair either. I already said I wasn’t looking for consensus, which is impossible. I’m just sharing what’s helpful for me! Josh, as always you article is interesting and informative; however, I would be remissed if I did not comment on what appears to be an awesome mullet in you photo. If you are indeed sporting that classiest of hairstyles, I do hope that, somewhere, a fan out there would has the artistic apptitude to create some altered art cards for you in which the fullness and stateliness of the mullet can be displayed. Thanks for all you, and the entire modernnexus.com team, do to keep the community informed and entertained. Amazed that you got my name wrong since it’s right next to the photo of me you’re referring to. Debuted this mullet in the Magic community at the same time as Monkey Grow (see below). “Retro” hairstyles are really well-positioned in the meta right now, and I always felt like mullets never got enough play. I kinda like the “zero to hero” heuristic, but here’s how I generally conceive of the fair/unfair spectrum. Fair Magic – Your decklist consists of creatures, removal and utility spells that generally improve your board position or disrupt the opponent. Unfair Magic- Your decklist eschews one or all of the above completely, preferring to utilize unintended synergies and interactions between cards that realign the game axis away from the battlefield. This is a continuum: Fish is fair. Zoo is fair. BGx is fair. Burn is mostly fair, but tilts in favor of unfairness by biasing most of its axis of attack to the stack rather than battlefield. Affinity is mostly fair, except it abuses a lot of unintentional synergies. Twin actually kinda plays fair Magic, but its decklist includes an unintended interaction that generally results in instant victory if it resolves and sticks. Infect is less fair, abusing unintended interactions (might of Old Krosa or Become Immense + Infect Creature) to win absurdly fast despite using “battlefield and stack”. Tron is unfair as it uses unintended interactions to ramp its mana nonlinearly, and then attack mostly through non-battlefield means (Karn, Ugin, etc). Bloom Titan is unfair, as the entire decklist is almost devoid or normal elements and is instead devoted to landing an early hasty titan that de facto ends the game. Storm, Ad Nauseam and Eggs are hardly recognizable as Magic decks to initiates (eschew the battlefield completely) and need to be explained, and thus are deeply unfair. Now, you can make the case that they didn’t “intend” any synergy between Goyf and Liliana of the Veil, but I’m talking about interactions that generate insane value or “zero to hero” moments. Gotcha. Unfortunately, it’s pretty hard for us to make calls about what Wizards does and does not see as they put new cards through testing. The Urza lands seem pretty intentional to me, but Tron is otherwise unfair according to your definition. On the flip side, Bolt-Snap-Bolt seems accidental and is seen exclusively in fair decks (or in gray area decks playing a fair game). I love this technical articles! Really gives me a broader perspective of the game, regardless of opinion. Excellent work!!! Too bad Day’s Undoing is going to break the format/magic/the table you play on so this will all change.